The term Arthro (joint) Kinetic (motion) Reflex was coined by University of Pittsburg researchers to describe how sensory input from joint movement reflexively activates or inhibits muscles – and no other place in the body is this concept more applicable than in the joints and connective tissues of the shoulder girdle. If sensory input from the sternoclavicular (SC), acromioclavicular (AC) and glenohumeral (GH) joints convey the idea that shoulder movement is safe, the nervous system will loosen its governor on rotator cuff strength and range of motion. If the information suggests the movement is dangerous, the brain may protectively guard the shoulder via muscle stiffness, pain, weakness, or altered coordination. The myoskeletal method seeks to first restore shoulder girdle function by clearing SC, AC, and GH joint fixations, and then assess for possible rotator cuff injury. In this column, we will focus on the neurology and kinesiology of a very important and oft-overlooked pivot joint that provides the only firm attachment of the shoulder girdle to the axial skeleton, and then I’ll demonstrate three of my favorite sternoclavicular joint techniques. Articular mechanoreceptors in shoulder girdle ligaments and joint capsules transmit movement information to the brain at a speed of 300 miles per hour where a movement map is created. Depending on the stimulus or lack thereof, these receptors can inhibit or facilitate surrounding muscle tone. A simple way to think about this is that “jammed joints” typically result in weaker muscles and mobile joints promote stronger muscles. So, when a joint has been strained or locked in an abnormal position, it causes a map clarity issue resulting in mild muscle strength alterations and loss of functional range. This is a protective mechanism the brain uses when it can no longer predict the movement that’s occurring. I’ve found that many rotator cuff injuries involve map problems due to dysfunctional joints. Image 2: The medial claicular heds should drop down during a shoulder shrug. 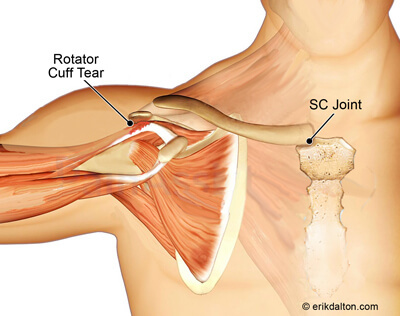 Rotator cuff impingement syndrome occurs when the supraspinatus tendon gets squashed between the humerus and the scapula’s acromion process during arm abduction. One of the primary and oft-overlooked causes is insufficient SC joint elevation of the clavicle. Recall that the SC joint should always move in an opposing direction to the scapula. Yet, tension, trauma and sub-optimal posture may cause the clavicle to get locked in a superior position on the manubrium and unable to glide down as the arm is raised. In these cases, manual and movement therapy to treat a frayed rotator cuff tendon is pointless until the SC joint fixation is corrected. Image 3: The therapist’s fingers depress the SC joint during arm aduction. To assess, we need to determine if the medial clavicular head is dropping down during two movements: arm abduction and shoulder elevation (shrugging). In Image 2, I assess for an SC joint elevation restriction by placing both index fingers on top of the client’s medial clavicular heads and asking him to first shoulder-shrug and then to horizontally abduct each arm. If one side does not drop down, there is a ligament or articular disc restriction in that SC joint. Try this on yourself by placing the left index finger on top of your right clavicular head and abducting the ipsilateral arm. Image 4: The SC joint should move posteriorly during shoulder girdle protraction. In Image 3 I demonstrate a technique for correcting a superiorly fixated SC joint. Notice how the fingers of my right hand firmly depress the client’s medial clavicle as my left hand abducts his right arm. When I meet the first restrictive barrier, I perform a contract-relax technique to help mobilize the ligament and articular disc. In Image 4, the client moves to the edge of the table and I bring hisarm to the first extension restrictive barrier and again perform a gentle contract-relax technique. I’ve found the combination of arm abduction and extension to be very effective in helping drop down and mobilize a superiorly fixated SC joint, but not always. The third and most common restriction seen at this very mobile joint occurs during protraction of the shoulders. In Image 5I assess by standing at the head of the therapy table and placing my index fingers on the anterior border of the medial clavicular heads. The client is asked to lift hisarms to 90 degrees and reach toward the ceiling. My fingers should feel the client’s medial clavicular heads translate posteriorly during this maneuver. If one or both sides do not move back, the restriction will alter acromioclavicular and glenohumeral movement causing reflex rotator cuff spam. Image 5: the therapist’s tight thenar eminence depresses the client’s AC joint while protracting their shoulder. To treat a right anteriorly fixated SC joint, I stand on the opposite side of the dysfunction and ask the client to grasp the back of my neck (Image 5). As my right thenar eminence contacts his right SC joint, my left hand snakes under his right scapula to create a counterforce. The client is asked to gently pull down on my neck as I lift his shoulder and resist with my right hand. This arthrokinetic reflex techniqueis very effective in helping relieve the protective guarding associated with SC joint fixation. By working with the client’s nervous system to increase tolerance, mobilization with movement also psychologically reinforces to the client that hecan move the arm through a greater range of motion. Cohen, Leonard A; Cohen, Manfred L (1956). “Arthrokinetic Reflex of the Knee”. American Journal of Physiology. Legacy Content.